This version of Shakespeare’s play – with some entirely new material, including songs, by Dominic Power – sold out completely at the Tobacco Factory, and then went on a successful U.K. tour, to Lancaster, Cheltenham, Scarborough, Exeter and Winchester. Please click on the button below to view the full text on our Resources page. 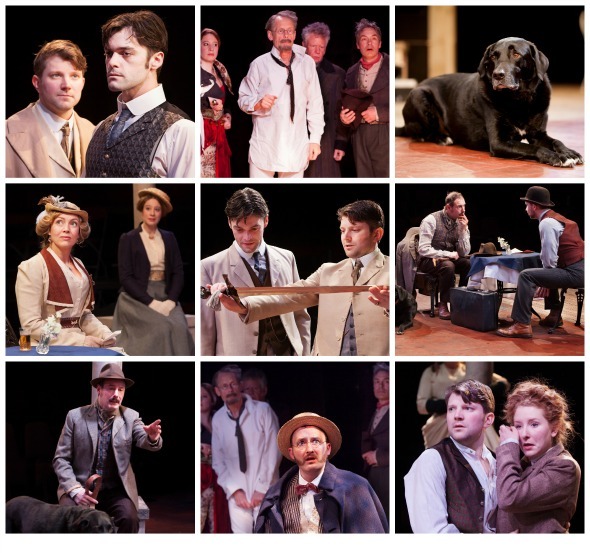 Clockwise from top: Piers Wehner as Proteus, Jack Bannell as Valentine, Eva Tausig as 1st Outlaw, Alan Coveney as Eglamour, David Plimmer as 3rd Outlaw and Thomas Frere as 2nd Outlaw, Lollio as Crab, Lisa Kay as Silvia, Marc Geoffrey as Speed, Dorothea Myer-Bennett as Julia, Paul Currier as Lord Turio Photos: Farrows Creative. 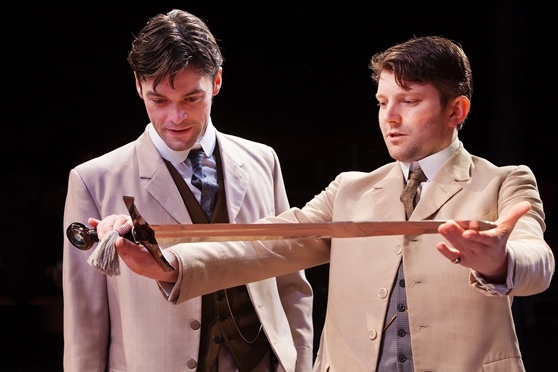 Two Gentlemen of Verona tackles matters of the mind and heart – principally friendship and sexual desire – as directly as any later Shakespeare play; and its characters live quite as fully as any Viola, Rosalind, Orsino or Orlando. For parting us – O, is all forgot? In Two Gentlemen Julia and Silvia have no relationship, except briefly when Julia is disguised as a boy; but the friendship between Valentine and Proteus – and their commitment to it – forms the mainspring of the drama. And its astonishing conclusion in the final scene – a conclusion often criticised for being far-fetched – is completely integral to Shakespeare’s darkly ambiguous purpose. We have brought the action forward to the early years of the twentieth century, where we believe the play’s characters and themes sit just as happily as they would in the late sixteenth century. There is no earlier edition of the play surviving than the 1623 quarto. No record remains of its first production and speculation about its date of composition varies widely between 1587 (making it probably Shakespeare’s first comedy) and 1594, or even 1595, putting it somewhere between The Taming of the Shrew and Romeo & Juliet. As so often with Shakespeare the influences are many, but two in particular stand out. Within Sir Thomas Elyot’sThe Governour, a treatise on moral philosophy aimed at the young men of the ruling class, is the story of two friends, Titus and Gisippus. The extraordinary demonstration of friendship that ends their story is offered by Elyot as a model for young men to emulate. The other is the Spanish romance ‘Diana Enamorada’ by Montemayor which was translated into English by Bartholomew Yonge. This was not published in London until 1598 but Shakespeare may have seen it in manuscript, or perhaps read an earlier translation in French. Told in the first person by Diana herself, it provided Shakespeare with material for both Two Gentlemen of Verona and Twelfth Night. In both cases his borrowing is easy to see in the edited excerpts we print after the press reviews below. **** The Independent What if there were no magic potion in A Midsummer Night’s Dream? What if your best friend fell for your girl and no enchanted flower could lift the spell? That is the premise of Shakespeare’s rarely performed comedy Two Gentlemen of Verona. And this is the play that director Andrew Hilton and Shakespeare at the Tobacco Factory have chosen to stage in rep with their recent Richard III. The play, often assumed to be Shakespeare’s first, tells the story of Valentine and Proteus. The latter is in love with Julia. Until, that is, he meets Valentine’s beloved, Sylvia. But, to be frank, the play is best-known as the only work in which Shakespeare cast a dog. Hilton and designer Harriet de Winton move the action to the early 1900s: all cream suits, café culture and crooners (with delightful music by John Telfer). But this is a production which never takes itself seriously: dancing waiters and erection jokes see to that. Piers Wehner is the fresh-faced cad Proteus, and he manages, for a while, to take the audience with him. But no actor, surely, could make this watered-down Iago an object of empathy for long. Jack Bannell doesn’t have it much easier in the dull and earnest role of Valentine. But when he’s banished, Bannell manages to create a rare moment of pathos. Sylvia and the long-suffering Julia, brought to life by Lisa Kay and Dorothea Myer-Bennett, are given more fighting spirit than Shakespeare perhaps intended, and the play is surely the more interesting as a result. But now – to the dog. Chris Donnelly as Launce, clownish servant and owner of ‘Crab’, regales the audience with the off-stage antics of his roguish pup: from stealing a capon to becoming too ‘amorously’ acquainted with a lady’s leg. His monologues are made all the more funny by the dog’s quiet obedience. It goes without saying that Crab manages to steal a couple of scenes – even from such a consummate Shakespearean clown as Donnelly. Elsewhere, Launce’s fellow comic, Speed, is brilliantly played by the quick-witted Marc Geoffrey. This play isn’t as deft as Twelfth Night, as enchanting as A Midsummer Night’s Dream or as dangerously seductive as The Tempest. But Hilton discovers in Two Gentlemen of Verona an unblinking portrait of love’s madness. There may be no magic bloom, but this production has a different kind of charm. And it’s not all down to the dog. The Stage A production set to delight audiences both in Bristol, where Two Gentlemen hasn’t been seen professionally for 62 years, and as far afield as Scarborough and Exeter on the tour. ***** What’s On Stage It’s tempting, only a little fancifully, to suggest that any decent company can put on a first-rate Richard III, but it takes a company of real talent to put on a brilliant production of Two Gentlemen of Verona, which is what Bristol’s Shakespeare at the Tobacco Factory has given us. Andrew Hilton’s characteristically clear and pacy production of Shakespeare’s first play is a delight from its opening exchanges to its final gesture and leaves one wondering only why this wise and witty comedy is not performed more often. The setting is Italy in the early years of the 20th century. Two friends are parting: Valentine is off to Milan to see some of the world; Proteus wishes to remain in Verona where he has recently fallen in love with Julia. After Proteus and Julia exchange rings Proteus travels to Milan to meet Valentine who has fallen in love with Silvia. Proteus’ feelings are transformed. Central to the evening’s pleasure are two superb performances. Piers Wehner’s Proteus captures the charms of the bantering friend and the devoted young suitor and the confusion and torments of the false friend and lover: we are simultaneously repelled and moved by him. Dorothea Myer-Bennett’s Julia is an immediately appealing presence, charming, self-aware and resourceful. She plays the comedy of the letter scene and her own transformation into a page beautifully. The rest of the cast is, as always with this company, uniformly excellent. The duologue between Jack Bannell’s Valentine and Peter Clifford’s Duke of Milan after the latter discovers the former’s plot is a masterpiece of comic timing. Lisa Kay’s Silvia embodies female steadfastness, good sense and solidarity in the face of male inconstancy and treachery. Marc Geoffrey and Chris Donnelly are outstanding as the servants, making the humour fresh and natural without ever overdoing it. Paul Currier’s preening Lord Turio is a vivid comic grotesque. And, of course, Lollio’s Crab nearly steals the show. Hilton makes good use of the in-the-round staging; the momentum never flags. The control of mood is masterful from the lightness and romance of the first half to the darker notes of the second. The music and singing are lovely and add to the atmosphere. Harriet de Winton’s design and Matthew Graham’s lighting are as effective as ever and I can’t have been the only male spectator coveting those gorgeous linen suits straight out of Chekhov. There have been a few textual additions and tweakings, but what comes through is Shakespeare’s understanding of the human heart and its motives, his command of metaphor and paradox and his early interest in themes and ideas that would inform his comic writing for the next two decades. After a month in Bristol the production is touring to Lancaster, Cheltenham, Scarborough, Exeter and Winchester. I urge you to go: it’ll be a long time before we see another production of the play as good as this. **** The Arts Desk Finely tuned cast brings sparkle to early Shakespeare. In spite of a text that feels at times like Shakespeare by numbers, Andrew Hilton’s tightly-knit company has once again pulled off an evening of captivating theatre. As in other productions from Shakespeare at the Tobacco Factory, the casting is pitch-perfect and the acting first class, down to the star performance of a hilariously mournful black dog. Two Gentlemen of Verona is an early piece, and although there are plenty of the touches of the genius that will illuminate the bard’s greatest plays, this tale of love, friendship, inconstancy and betrayal is almost too smoothly constructed. The seams in the narrative are at times a little obvious. The tropes which will recur in later work – the woman dressed up as a page boy, the quartet of young lovers, the forest wilderness in which fate unfolds away from the pomp and pretence of the city – are there in embryonic form but without the dramatic daring that Shakespeare will display in plays like Twelfth Night and A Midsummer Night’s Dream. That this production manages to transcend the limitations of a play that shines with promise but lacks a certain depth says a lot about Andrew Hilton’s mastery and the finely tuned performances of the cast. Dorothea Myer-Bennett brings tangible subtlety and emotional resonance to the role of Julia, moving well between the near-hysteria and indecision she displays in the first act through to the courageous determination that leads her to follow her the inconstant Proteus to Milan. As “false perjured” Proteus, who betrays his best friend Valentine as well as Julia, Piers Wehner navigates the inner psychological flux of his character with sensitivity. This is a man let down by weakness rather than driven by perfidy, buffeted by his emotions and made blind by the “malady” of love. Lisa Kay is a commanding presence as the constant and clear-headed woman, and Jack Bannell portrays the inner turmoil of Valentine’s roller-coaster journey with charisma and assurance. Plays International Two Gentlemen of Verona is one of Shakespeare’s early plays but it has all the confidence and zest of the later comedies with a plot slightly more easy to follow. Basically, only one of these two avowed friends is actually a gentleman: the other is disloyal, devious, and disturbingly inattentive to detail since he can’t recognise his own dumped girlfriend in slacks pretending to be a boy. Mistaken identity, and the convention of impenetrable disguise, are themes and conceits the bard used much in later plays, and here they send abandoned Julia off with her maid to find, and forgive, deceitful Proteus and restore Silvia to loyal Valentine so the mixed-up lovers, as at the end of Midsummer Night’s Dream, can be reunited. The laughs – and there are many – come mainly from the servants’ interaction with their masters and mistresses, and with each other, which is so fast-paced and droll one suspects much credit should be given to Dominic Power for his ‘edition and additional lyrics’. Set and costume design are great, elegantly evoking an indolent era of class distinctions, and an amazing cast ensure each scene sparkles with wit. Special appreciation to Piers Wehner as Proteus who manages the difficult feat of remaining endearing despite his conniving, Jack Bannell as a gorgeously heroic Valentine and Chris Donnelly who with Lollio as Crab the dog provided some of the best moments in a superb evening of theatre. The wonderful history of Titus and Gisippus, whereby is declared the figure of perfect amity. There was in Rome a noble senator named Fulvius, who sent his son Titus to the city of Athens in Greece, there to learn good letters, and caused him to be hosted with a worshipful man of that city called Chremes. This Chremes had a son named Gisippus, who not only was equal to young Titus in years, but also in stature, proportion of body, favour, and colour of visage, countenance and speech. The two children were so alike, that without much difficulty it could not be discerned of their own parents, which was which. These two young gentlemen, as they seemed to be one in form and personage, the same nature wrought in their hearts such a mutual affection, that their wills and appetites daily more and more confederated themselves … They together went to their learning and study, and to their meals and recreation; they delighted both in one doctrine, and profited equally therein; within a few years few within Athens might be compared unto them. At the last died Chremes, which was not only to his son, but also to Titus, cause of much sorrow and heaviness. Gysippus, by the goods of his father, was now known to be a man of great substance, wherefore there were offered to him great and rich marriages. And he being of ripe years and goodly personage, his friends and kin exhorted him to take a wife. But the young man, having his heart already wedded to his friend Titus, and his mind fixed to the study of Philosophy, refused to be persuaded; until at the last, partly by the consent and advice of his dear friend Titus, he assented to marry such one as should like him. What shall need many words? His friends found a young gentlewoman, which in equality of years, virtue, nobility of blood, beauty, and sufficient riches, they thought was for such a young man apt and convenient. And when they and her friends upon the covenants of marriage were thoroughly accorded, they counselled Gysippus to repair unto the maiden, and to behold how her person contented him. And he found her in every form and condition according to his expectation and appetite; wherat he much rejoiced and became of her amorous, often times leaving Titus at his study secretly to repair unto her. At the last he disclosed to Titus his secret journeys, and what delectation he took in beholding the excellent beauty of her whom he purposed to marry, and how, with her good manners and sweet entertainment, she had constrained him to be her lover. And on a time they went together to his lady, by whom Titus was received most joyously. But Titus, as he beheld so heavenly a personage adorned with beauty inexplicable … was thereat abashed, and had his heart through pierced with the fiery dart of blind Cupid. Of the which wound the anguish was so exceeding and vehement, that neither the study of Philosophy, nor the remembrance of his dear friend Gysippus, who so much loved and trusted him, could withdraw him from that unkind appetite, but that of force he must love inordinately that lady, whom his friend had determined to marry. Albeit with incredible pains he kept his thoughts secret, until that he and Gysippus were returned unto their lodgings. Then the miserable Titus, withdrawing him as it were to his study, all tormented and oppressed with love, threw himself on a bed, there rebuking his own most despiteful unkindness, which conspired against his most dear friend Gysippus, against all humanity and reason. He cursed his fate and wished that he had never come to Athens. And therewith he sent out from the bottom of his heart deep sighs, in such plenty that it lacked but little that his heart was not riven in pieces. At the last the pain became so intolerable, that he was inforced to keep his bed, being brought in such feebleness that his legs might not sustain his body. … as I was [living] in my grandmother’s house, and almost seventeen years old, a certain young Gentleman fell in love with me, who dwelt no further from our house then the length of a garden terrace, so that he might see me every summer’s night when I walked in the garden … Many days Don Felix spent in endeavouring to make me know the pains which he suffered for me, and many more did I spend in making the matter strange, and that he did not suffer them for my sake. And I know not why Love delayed the time so long in forcing me to love him, but only that (when he came indeed) he might enter into my heart at once, and with greater force and violence. When he had, therefore, by sundry signs, as by Tilts and Tourneys, and by prancing up and down upon his proud Jennet before my windows, made it manifest that he was in love with me he determined in the end to write a letter unto me; and having practised divers times before with a maid of mine, and at length, with many gifts and fair promises, gotten her good will and furtherance, he gave her the letter to deliver to me. Methinks I see now the crafty wench, how she held her peace, dissembling very cunningly the sorrow that she conceived by my angry answer; for she fained a counterfeit smiling, saying, “Jesus, Mistress, I gave it you because you might laugh at it, and not to move your patience with it in this sort; for if I had any thought that it would have provoked you to anger, I pray God he may show his wrath as great towards me as ever he did to the daughter of any mother.” And with this she added many words more (as she could do well enough) to pacify the fained anger and ill opinion that I had conceived of her, and taking the letter with her, she departed from me. This having passed thus, I began to imagine what might ensue thereof, and love (methought) did put a certain desire into my mind to see the letter, though modesty and shame forbad me to ask it of my maid, especially for the words that had passed between us. Please click on the button below to view the sources on our Resources page.